Please join us in Kansas City, Missouri, on April 11 and 12 for exciting conversation where we consider the possibilities inherent in more dynamic forms of governance. Editors’ note: This article was abridged and adapted from the article “Governance and Accountability: Broadening the Theoretical Perspective,” published by Nonprofit and Voluntary Sector Quarterly (February 2015; vol. 44, no. 1; published online before print October 1, 2013; doi: 10.1177/0899764013503906.) 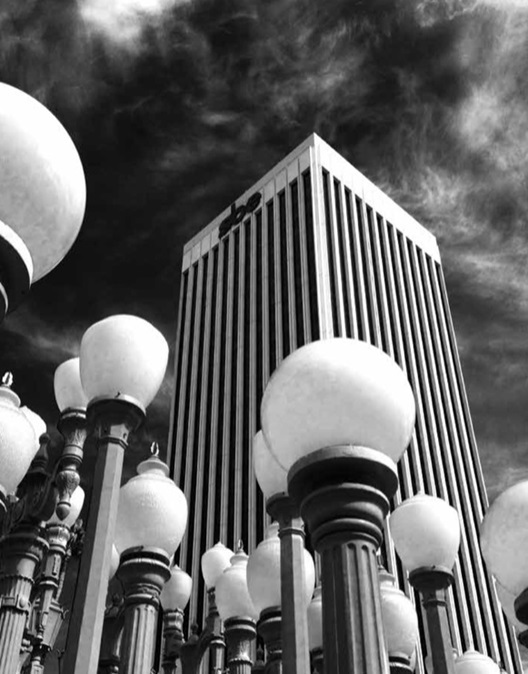 This article is from the Nonprofit Quarterly’s spring 2016 edition, “Strategic Nonprofit Management: Frameworks and Scaffolding,” and was first published online on May 16, 2016. Governance is of central concern to nonprofits, yet theories of nonprofit governance are underdeveloped in comparison with corporate governance; and, specifically, it appears that knowledge of governance practices to achieve broadened accountability to multiple and diverse stakeholder groups has lagged. This article aims to expose and question the assumptions and asymmetrical power relations that are often taken for granted in the most normative of the governance theories used by nonprofits. In doing so, I challenge the notion of accountability as a somewhat benign and straightforward governance function, and recast it as a challenging, complex choice. Within the logic of unitarism, conflicting objectives are seen as dysfunctional, and agents’ accountability to principals takes precedence and is enacted through adherence to monitoring, accounting and auditing, and the law.4 In “Trust and Control in Anglo-American Systems of Corporate Governance,” John Roberts argues that such formal hierarchical accountability creates “a sense of self as singular and solitary within only an external and instrumental relationship to others.”5 Here, we can draw parallels with narrow constructs of accountability presented in the nonprofit literature where the affiliation between nonprofits and their evaluators constitutes a typical principal–agent relationship founded on instrumental, rule-based accountability involving explicit and objective standards of assessment.6 Indeed, in “The Defects of Stakeholder Theory,” Elaine Sternberg argues that accountability is only legitimate in circumstances where principals have the authority to hold agents to account, and attacks stakeholder theory for “destroying” conventional accountability.7 In short, she posits that just because organizations are affected by and affect certain factors, such as the environment, does not mean they are accountable to them. Principal–agent theories thus cast accountability as “the means by which individuals and organizations report to a recognized authority and are held responsible for their actions.”8 This may act to marginalize broader constructs of accountability based on “felt responsibility,” or taking responsibility for one’s own actions,9 which would be central to critical management endeavors and their deliberate attempts to enhance empowerment and the voices of the less powerful. But alternate governance theories such as stakeholder and democratic theory exist, directly challenging the foundations of unitary, principal– agent theories. One of the key purposes of the challenges inherent in these approaches is to extend companies’ responsibilities beyond those enshrined in law, which are often premised on minimal standards. Stakeholder and democratic theory are thus driven by what may be termed a process–relational view of work and organizations, characterized by the acceptance of multiple individuals and groups with divergent interests and priorities, requiring “continuous social, political…and moral processes.”10 The central logic is one of pluralism, where diverse groups’ pursuit of disparate interests can produce conflict,11 which is considered both inevitable and a possible driver of social transformation.12 There are, however, differences between the practices associated with stakeholder and democratic theory, which I will briefly draw out. Table 1, below, was created to frame the empirical findings and address the question of what implications exist for accountability in various governance theories and practices. 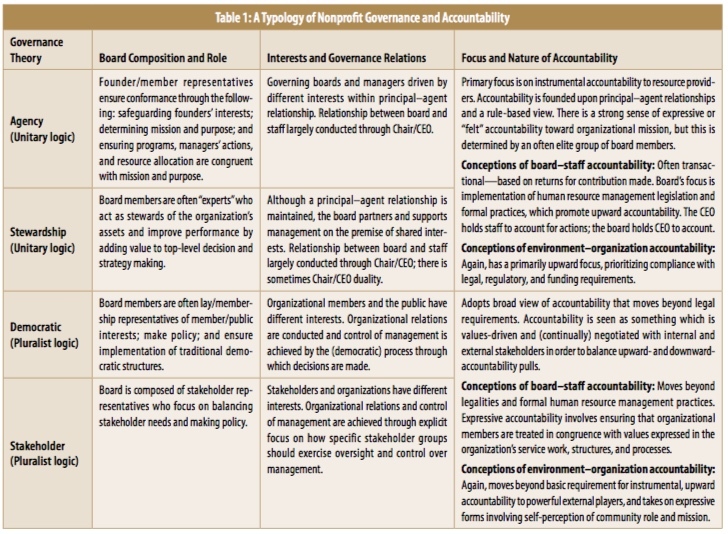 It delineates the potential consequences of diverse governance assumptions for the nature of accountability in nonprofit organizations. Specifically, the implications of the governance theories foreshadowed in the earlier literature summary are linked to board composition and role, board–staff interests, and the subsequent focus and nature of accountability relations. It should be noted, however, that practitioners do not necessarily operate consistently within a particular stance, and often vary their approach within a specific context. Rather than claiming that the taxonomy presented is exhaustive, I would point to its heuristic value that exposes the possibility of diverse views of governance and accountability, thus illustrating the range of choices available to nonprofit practitioners. The following section discusses the analysis underpinning development of the preceding typology. This section illustrates how agency and stewardship governance assumptions, based on a unitary logic, can produce particular effects on the nature of accountability. First, however, it is important to highlight the distinguishing features, which suggest the central logic of Case A and Case B to be unitary (see Table 2). At an informal level, there seems to be an attempt to “build strong cultures,” where employees share their leader’s beliefs, assumptions, and vision for the organization.25 Case A’s employees are socialized with the founding story of a visionary faith leader who identified the need and established provision for “the needy,” while within Case B there is constant reference to the historical military links of the museum and maintaining an authoritarian approach consistent with that tradition. In each case, the historical roots of the organization are used to legitimize the authority of a select group of leaders (principals) over a group of subordinate followers (agents) and to ensure the principals’ goals are accepted as natural, unchallengeable, and given. 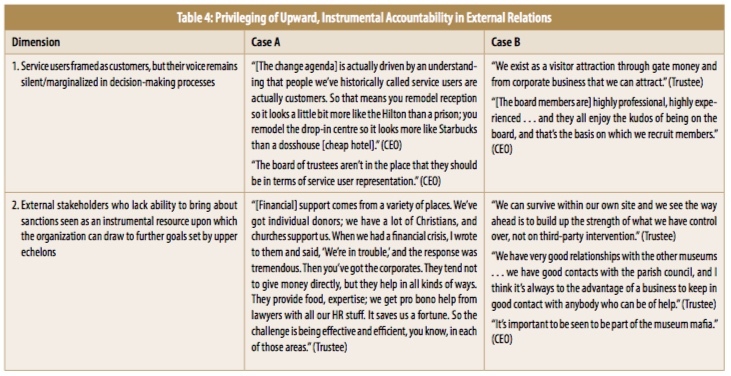 Table 3 illustrates the various ways in which Case A and Case B reinforce instrumental accountability within internal relations. Within such contexts, the construct of instrumental relationships at the individual level seems to reproduce at the organizational level, leading to the prioritization of instrumental transactional relationships to external stakeholders. Roberts argues that dominance of external market mechanisms contributes to producing such forms of accountability,26 and it is noteworthy that the organization we are calling Case B has the highest level of earned income and is run as an “attraction business,” while the organization we are calling Case A has the second-highest proportion of earned income—albeit marginally—with the ambition to increase this type of income. With both cases, references to “professionalization,” “amateurism,” and “business” are prevalent within the narratives of senior organizational actors, and compliance with legal and regulatory obligations seems to take priority. External stakeholders, such as service users, who lack the authority to bring about sanctions, appear marginalized in decision-making processes in favor of viewing them as customers or consumers of services. Moreover, donors and other players in the external environment are looked upon as an instrumental resource to further the goals set by the organizations’ elite (see Table 4). My analysis indicates that if missions, visions, and goals are developed and governed solely by organization elites, it is their perspectives that become prioritized and legitimized at the organization level. Prioritization of principals’ interests is not considered a problem if principals’ appointments are assumed to be based on merit. They are assumed to be the rightful guardians of the organization’s overall purpose, which is pursued in the best interests of all members—whether they realize it or not. As Table 2 suggests, rationality is “automatically accorded to decision making of the leadership and the behavior of subordinates who might be recalcitrant or even resistant to such direction becomes deemed to be irrational.”27 I find that in this situation, broader conceptions of expressive accountability based on moral foundations often can be marginalized in favor of narrow conceptions of hierarchical accountability within instrumental principal–agent relationships. By conceptualizing accountability in this way, the priorities of the majority of organization members and wider community stakeholders who are affected by the organization’s operation may be marginalized or excluded. Moreover, this narrow instrumental view of human nature can appear at odds with the values embedded in the social mission of many nonprofit organizations. 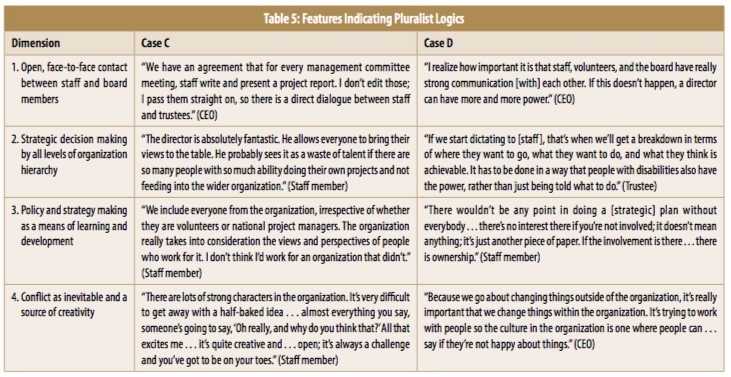 Table 5 illustrates the characteristics that imply a central pluralist logic in Case C and Case D.
Despite maintaining a structural separation of board and staff, a requirement of U.K. charity law and also often a strategy to reassure funders, regulators, and other interest groups, the reality of organizational life is very different.28 Much value, for example, is placed on locating decisions in democratic discourse (see dimensions 2 and 3, Table 5), perhaps based on the recognition that transactions are “conducted on the basis of mutual trust and confidence sustained by…mutually obligated and legally non-enforceable relationships.”29 It is particularly notable that there is an element of self-governance, as appointment of trustees is conditional on prospective board members spending time with and receiving approval from the “governed,” who are, in turn, often people with disabilities. Despite these differences, actors within both organizations arguably display skepticism about the moral defensibility of dominant models of management and organization and the automatic rights of organizational elites to govern and manage. I find that such an approach often leads organizations like Case C and Case D to go beyond instrumental, hierarchical forms of accountability to a broader, expressive view of accountability involving ongoing social, political, and moral processes between internal groups. Such processes and practices of accountability can create socializing effects, often involving face-to-face accountability between people of relatively equal power, in a cultural if not structural sense. The ability of trustees and managers to pursue organizational strategy in this context seems to require account to be taken of employees’ perceptions of its legitimacy. Table 6 suggests various ways in which Case C and Case D reinforce expressive accountability within internal relations. Within such contexts, the view that social relations involve moral, ethical, and political processes is also applied to relationships with external stakeholders. 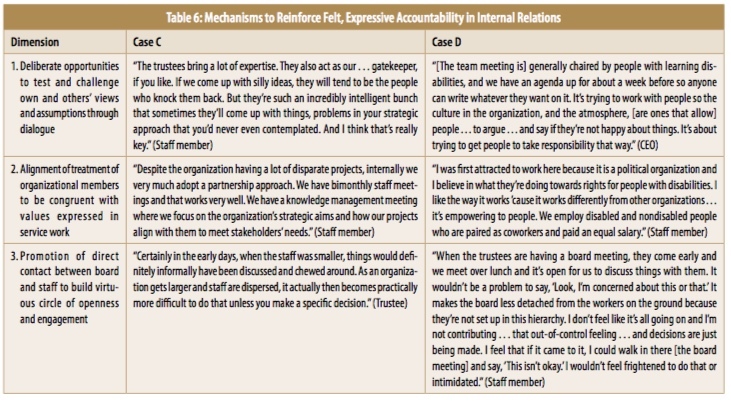 Here, the focus moves beyond instrumental, upward accountability to those who have the authority to hold the organization accountable, and can take on expressive forms based upon sets of relationships and understandings of community roles and mission (see Table 7). While theorization of corporate governance has become increasingly sophisticated, theories of nonprofit governance are comparatively underdeveloped. Advances have been made regarding the effects of particular systems of governance on processes of accountability within the corporate domain.32 In the nonprofit arena, however, theoretical developments surrounding the nature of accountability transcend understanding of nonprofit governance. In particular, understanding of governance to achieve broad accountability—as called for by numerous nonprofit scholars—has lagged. By addressing the underlying philosophical and relational issues in governance, this article frames nonprofit governance and accountability as social and dynamic processes. Each governance theory is infused with assumptions of how organizations work and the interests of the diverse parties involved. The analysis presented suggests that unitary logics tend to focus the work of principals on producing policies and procedures to control the work behavior of agents. The purpose of internal accountability is to constrain an opportunistic and self-interested human nature through trustees and, subsequently, senior managers attempting to institutionalize their power over others. This can result in transactional or instrumental relationships governed by the system and created by those at the apex of the organization. Equally, organizational members often prioritize compliance with the formal rules of powerful players within the external environment who have the authority to hold the organization to account. Accountability can thus take on a narrow, hierarchical form. In contrast, while pluralist logics do not reject the notion of control, they recognize that only partial control can ever be achieved. Organizations exist only through human relationships, and whatever control is achieved is “brought about as much through processes of negotiation, persuasion and manipulation as through system devices like rules and official procedures.”33 Similarly, external stakeholders are seen as part of social groups where interests diverge. Expressive, negotiable accountability to a broad range of stakeholders is often seen as central to organizational mission and legitimacy within society. It has been argued that framing organizations as social collectives in this way is a “vital source of learning and can produce complex relationships of respect, trust, and felt reciprocal obligation, which far exceed the purely instrumental orientation to action that agency theory assumes.”34 The four governance theories reviewed thus represent distinct schools of thought, which are infused with specific and sometimes opposing assumptions about the nature of work and organization that hold major implications for the treatment of stakeholders. See Roger Friedland and Robert R. Alford, “Bringing Society Back In: Symbols, Practices, and Institutional Contradictions,” in The New Institutionalism in Organizational Analysis, eds. Walter W. Powell and J. DiMaggio (Chicago: University of Chicago Press, 1991), 232–63; and W. Richard Scott, Institutions and Organizations, 2nd ed. (Thousand Oaks, CA: SAGE Publications, 2001). Tony Watson, Organising and Managing Work, 2nd ed. (Harlow, UK: Financial Times Prentice Hall, 2006). Lex Donaldson and James H. Davis, “Stewardship Theory or Agency Theory: CEO Governance and Shareholder Returns,” Australian Journal of Management 16, no. 1 (June 1991): 51–52. See James H. Davis, F. David Schoorman, and Lex Donaldson, “TOWARD A STEWARDSHIP THEORY OF MANAGEMENT,” Academy of Management Review 22, no. 1 (January 1997): 20–47; Elaine Sternberg, “The Defects of Stakeholder Theory,” Corporate Governance: An International Review 5, no. 1 (January 1997): 3–10; and Marc Jegers, Managerial Economics of Non-Profit Organizations (London: Routledge, 2008). John Roberts, “Trust and Control in Anglo-American Systems of Corporate Governance: The Individualizing and Socializing Effects of Processes of Accountability,” Human Relations 54, no. 12 (December 2001): 1547–72. See J. Bart Morrison and Paul Salipante, “Governance for Broadened Accountability: Blending Deliberate and Emergent Strategizing,” Nonprofit and Voluntary Sector Quarterly 36, no. 2 (June 2007): 195–217; and Wenjue Lu Knutsen and Ralph S. Brower, “Managing Expressive and Instrumental Accountabilities in Nonprofit and Voluntary Organizations: A Qualitative Investigation,” Nonprofit and Voluntary Sector Quarterly 39, no. 4 (August 2010): 588–610. Michael Edwards and David Hulme, eds., Beyond the Magic Bullet: NGO Performance and Accountability in the Post–Cold War World (West Hartford, CT: Kumarian Press, 1996). Andrea Cornwall, Henry Lucas, and Kath Pasteur, “Introduction: Accountability Through Participation: Developing Workable Partnership Models in the Health Sector,” IDS Bulletin 31, no. 1 (January 2000): 1–13. Watson, Organising and Managing Work. See John Darwin, Phil Johnson, and John McAuley, Developing Strategies for Change (Harlow, UK: Financial Times Prentice Hall, 2001). See Alan Fox, “Industrial Sociology and Industrial Relations: An Assessment of the Contribution which Industrial Sociology Can Make towards Understanding and Resolving Some of the Problems Now Being Considered by the Royal Commission,” Royal Commission on Trade Unions and Employers’ Associations, Research Paper no. 3 (London: Her Majesty’s Stationery Office, 1966). See Kevin Gibson, “The Moral Basis of Stakeholder Theory,” Journal of Business Ethics 26, no. 3 (August 2000): 245–57. Gerald Vinten, “Shareholder versus Stakeholder—Is There a Governance Dilemma?” Corporate Governance: An International Review 9, no. 1 (January 2001): 36–47. Pierre-Yves Gomez and Harry Korine, Entrepreneurs and Democracy: A Political Theory of Corporate Governance (Cambridge, UK: Cambridge University Press, 2008). See Chris Cornforth, “The Governance of cooperatives and mutual associations: a paradox perspective,” Annals of Public and Cooperative Economics 75, no. 1 (March 2004): 11–32. See Steve Letza and Xiuping Sun, “Philosophical and Paradoxical Issues in Corporate Governance,” International Journal of Business Governance and Ethics 1, no. 1 (2004): 27–44. See Michael C. Jensen and William H. Meckling, “Theory of the firm: Managerial behaviour, agency costs, and capital structure,” Journal of Financial Economics 3, no. 4 (October 1976): 305–60. See Melinda M. Muth and Lex Donaldson, “Stewardship Theory and Board Structure: a contingency approach,” Corporate Governance: An International Review 6, no. 1 (January 1998): 5–28. Donaldson and Davis, “Stewardship Theory or Agency Theory,” 49–64. See Nikolas Rose, Governing the Soul: The Shaping of the Private Self (London: Routledge, 1989). Joanne Martin, Organizational Culture: Mapping the Terrain (Thousand Oaks, CA: SAGE Publications, 2001), 8. John McAuley, Joanne Duberly, and Phil Johnson, Organization Theory: Challenges and Perspectives (Harlow, UK: Financial Times Prentice Hall, 2007), 15. Shann Turnbull, “Corporate Governance: Its scope, concerns and theories,” Corporate Governance: An International Review 5, no. 4 (October 1997): 180–205. Rogers Hollingsworth, Philippe C. Schmitter, and Wolfgang Streeck, “Capitalism, Sectors, Institutions and Performance,” in Governing Capitalist Economies: Performance and Control of Economic Sectors, eds. J. Rogers Hollingsworth, Philippe C. Schmitter, and Wolfgang Streeck (New York: Oxford University Press, 1994), 6. McAuley, Duberly, and Johnson, Organization Theory, 26. Richard Steinberg, “Principal–agent theory and nonprofit accountability,” in Comparative Corporate Governance of Non-Profit Organizations, eds. Klaus J. Hopt and Thomas Von Hippel (Cambridge, UK: Cambridge University Press, 2010), 73–125. Is Each Site in Your Nonprofit Network Raising as Much Revenue as It Can? In multisite networks of nonprofits, you will always find uneven fundraising performance from one community to another. This article presents an analytic tool common in the corporate world to use in considering the reasons behind the success or lack thereof of revenue generation in a particular community.